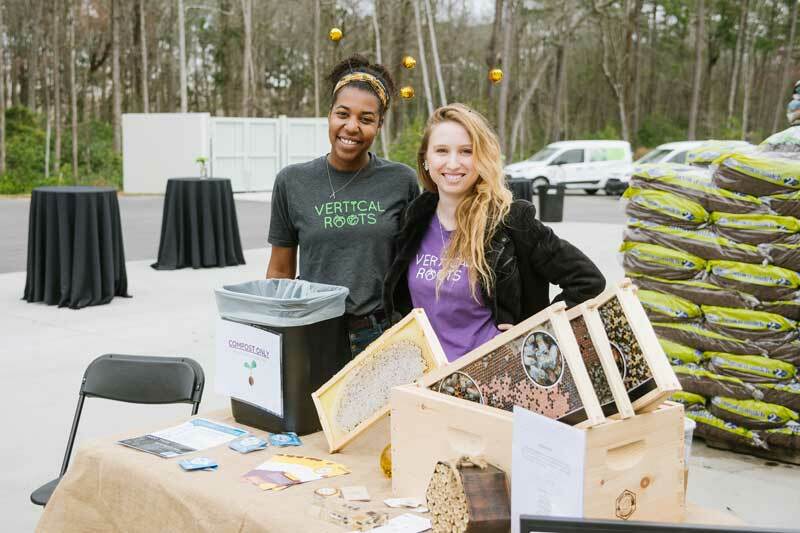 Vertical Roots focuses on our customers, products, people, and the planet. Learn how we are transforming the lettuce industry one community at a time. Aligning with our company goals, we continually give back to the earth and lower our carbon footprint. We are working to provide our communuity with opportunities to work with and learn more about bees. Our kitchen is stocked with ceramic plates, silverware, glassware, reusable straws and bags. Aiding non-profit organizations, such as Surfrider Foundation, to protect our waterways, beaches, and coastal economy. We offer tours in our Community Farm to demonstrate our growing methods and technology. All proceeds are donated to charity. We’re staying involved with other companies that align with our beliefs and mission. We can’t get there alone. We believe education is a key factor to evoking change within our communities. From events, to social media, to friendly neighbor conversations, we’re open to sharing what we know and why it matters. We can’t help our communities if we’re not connected. We’re proud members of: SC Farm Bureau, SC Dept. of Agriculture, Carolina Farm Stewardship Assoc., Lowcountry Local First, and SC Chamber of Commerce, just to name a few. Committed to Improvement. Open to Evolving. Our focus is on reducing our carbon footprint, but big changes don’t happen overnight and there are multiple solutions to a problem. It’s silly to think we’re doing everything perfectly – we’re not. We are always open to new ideas for improvement and sustainability. Living out our mission motivates all of us. As a company we believe the revolution starts with the Farmer. Check out all available positions on our career portal. If you have any questions, would like to know more about us, or if you'd like to take a tour of our Community Farm, send us a message.